Fort Vancouver, located in Vancouver, Washington, was established in 1825 along the banks of the Columbia River at River Mile (RM) 106.5. The fort was a fur-trading post for the British Hudson's Bay Company. "... 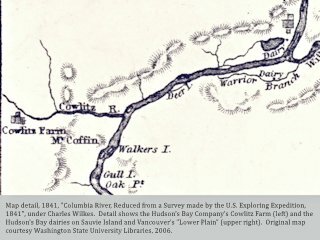 In 1824, George Simpson, North American governor of the Hudson's Bay Company, ordered the abandonment of Ft. George and the search for a new post on the north side of the Columbia River, Criteria for locating the new post included the desire to strengthen British claims to the land north of the Columbia River, and for the HBC to render themselves '... independent of foreign aid in regard to Subsistence.' The search for suitable terrain -- land lacking steep banks or low, flood prone areas -- ended at Jolie Prairie, about one hundred miles from the mouth of the Columbia River. ..."
Source: U.S. National Park Service website, 2005, Fort Vancouver. 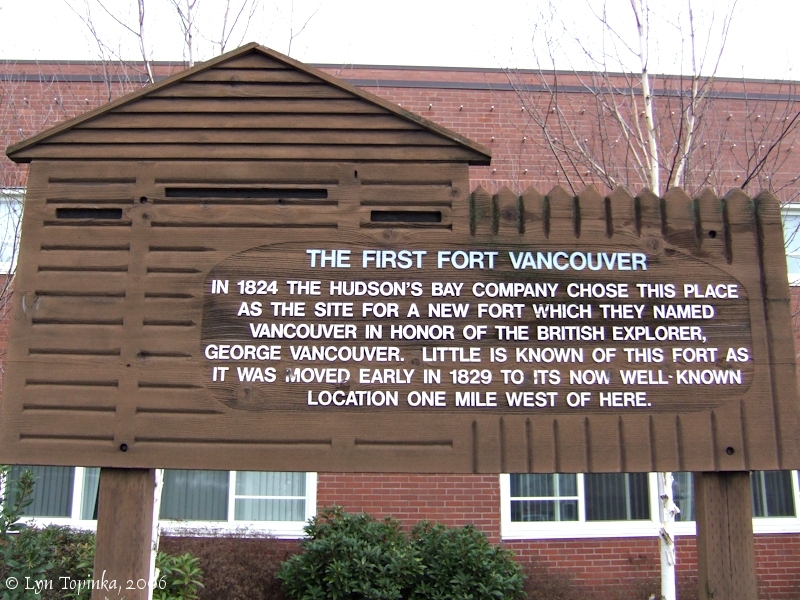 "... Fort Vancouver (the site of the present city of Vancouver, and the United States military depot) was established in 1824 by Dr. John McLoughlin, manager of the Hudson's Bay Company trade on the Pacific coast. The post was inclosed in a stockade, two hundred yards by one hundred and seventy-five yards, defended by bastions at the southeast and northwest angles, on which bastions were mounted heavy guns. In the inclosure were the residence of the chief executive officer, two buildings occupied by clerks, a row of buildings for residences of families, five large two-story houses, with a number of offices. The original site stood upon high ground a half mile back from the river. Outside was a huge warehouse, and a salmon house on the banks of the Columbia river. Near the fort was a village of cabins affording dwellings to numerous Kanakas, Canadians and servants of the company. A grist-mill was erected in 1836, and the company also established a saw-mill, which was prevented from running at high stages of water. Several tracts of land were occupied and cultivated by servants. Fort Vancouver was the headquarters of the Columbia district, which included all the territory west of the Rocky Mountains. The returns from all the posts in Oregon were made to this point; and from here all accounts were transmitted for settlement. The chief factors were located at this post, and a very large business was transacted. ..."
Source: "History of the Pacific Northwest, Oregon and Washington", 1889, vol.1. 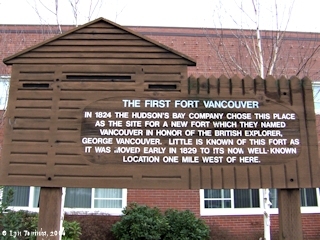 In 1849 the Hudson's Bay Company transfered its headquarters from Fort Vancouver north to Fort Victoria in Canada, leaving behind a small contingent of men. 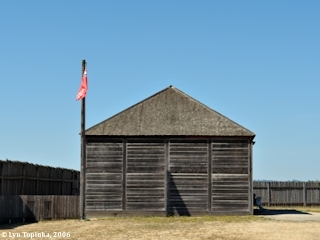 A U.S. Army post was established in May 1849 next to the Hudson Bay Company "fort". This new Army Post was called "Columbia Barracks" until 1853 when it was renamed "Fort Vancouver". In 1879 the Army Post was again renamed, this time to "Vancouver Barracks". In June 1860 the British totally abandoned the Fort Vancouver and moved, leaving the fort and village to the Americans. The Army occupied some of the buildings, but fire destroyed all visible traces of the establishment by 1866. 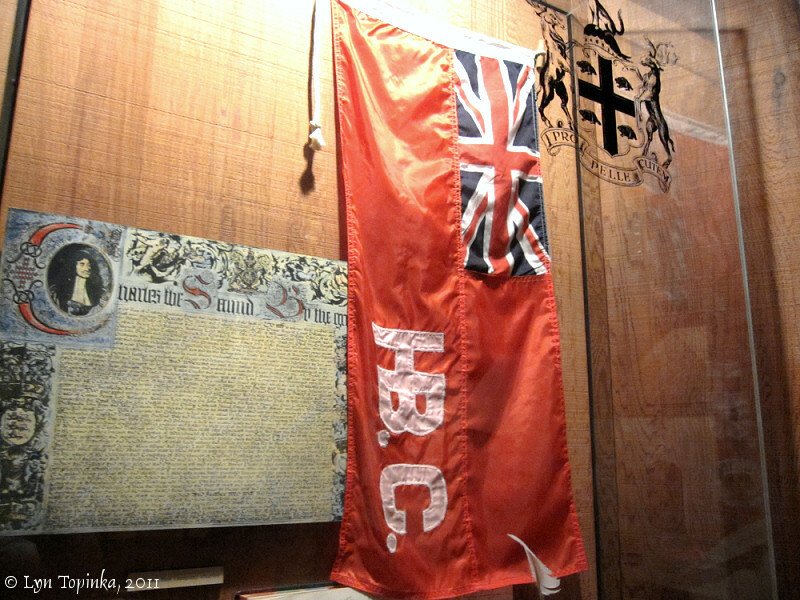 Click image to enlarge Hudson's Bay Company flag, Fort Vancouver Museum, Vancouver, Washington. Image taken August 2, 2011. 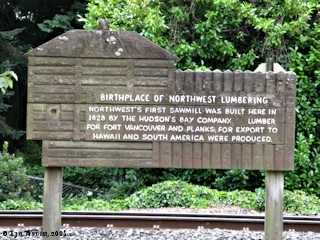 Click image to enlarge Sign, The First Fort Vancouver, Washington. The first Fort Vancouver was located at the location of today's Washington State School for the Deaf. Image taken March 12, 2006. Click image to enlarge Sign, "Hudson's Bay Historic Neighborhood". Image taken August 26, 2006. Government Island, and two smaller islands are located in the center of the Columbia River, between River Mile (RM) 111.5 and River Mile (RM) 118. Lewis and Clark camped on Government Island on November 3, 1805. The Hudson's Bay Company used to gather grass on Government Island to feed their oxen. 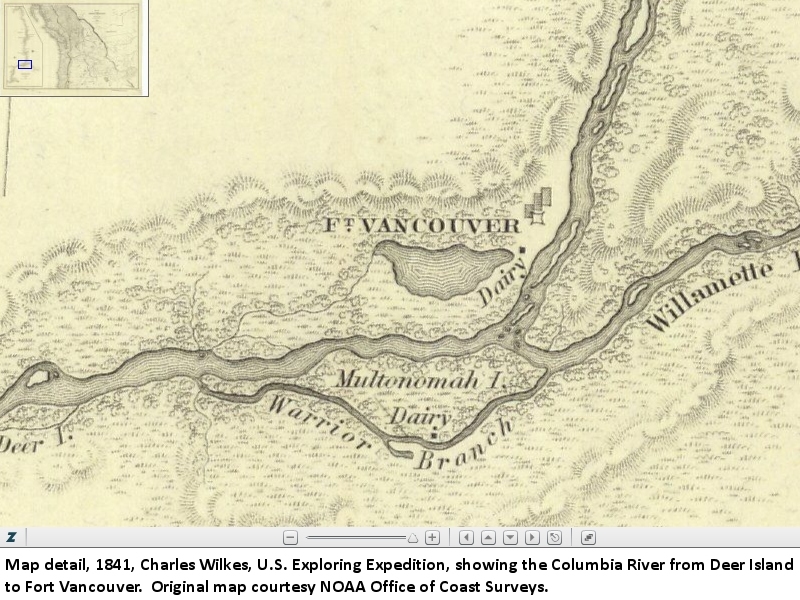 "Another Columbia River island, about six miles east of Fort Vancouver, was utilized by the Company post. According to William Crate, who built sawmills for the post during this period on a site opposite the island, Fort Vancouver's employees gathered grass on the island to feed to oxen stabled near the mills. The island, referred to as Goose Grass Island during this period, was later mentioned in the Company's claims for compensation from the United States Government as the "Saw-Mill Island." It was referred to as Miller's Island when the U.S. Army reserved its use for raising hay in 1850; by 1867 it was referred to by its present name, Government Island." 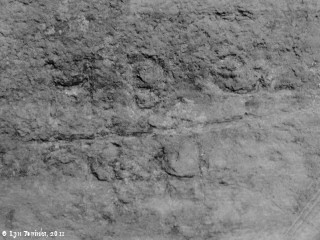 One exhibit located in the Columbia Gorge Interpretive Center Museum, located just west of Stevenson, Washington, is a "mystery rock" believed to be associated with the Hudson's Bay Company. "In 1923 a road crew pulled the Skamania County "mystery rock" from the Government Slide near the Cascades. For decades the stone stood near the entrance to Stevenson High School. Its inscription -- "HBCo[y] 1811" -- remained unexplained. 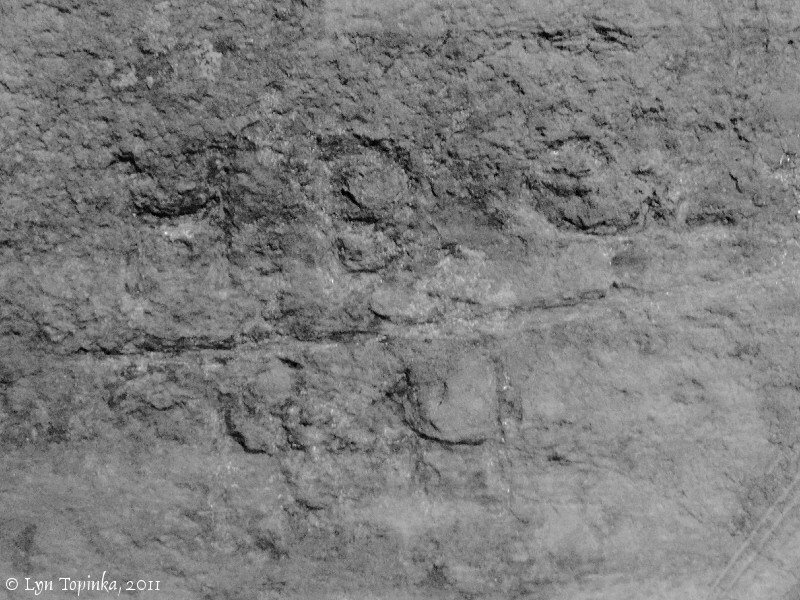 Retired attorney David Swart, a man deeply interested in the early fur trade, believes the stone marks the expedition of Joseph Howse. 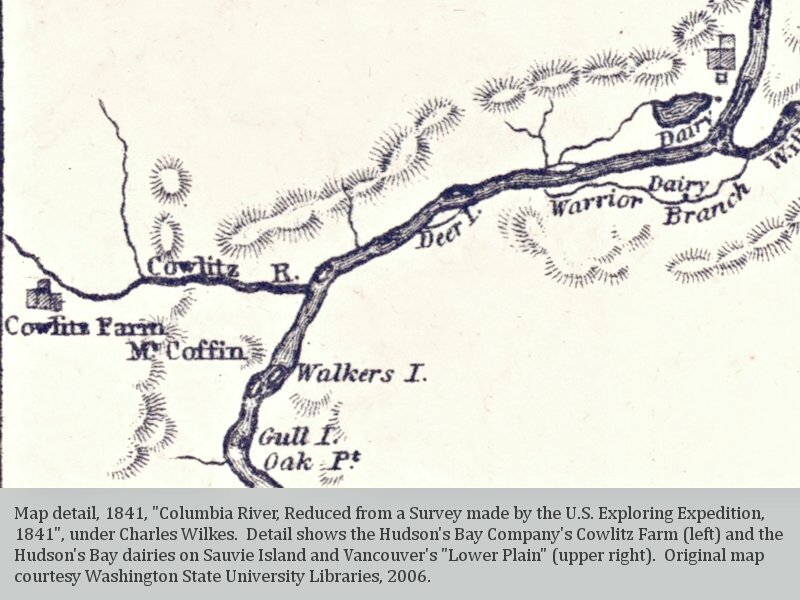 In 1810-11 Howse led a party of seventeen men across the Rockies and descended the Columbia River to at least this point more than six months before the well-known explorer David Thompson. Unfortunately neither Howse's journal nor letters written by him were preserved; Thompson's survived." 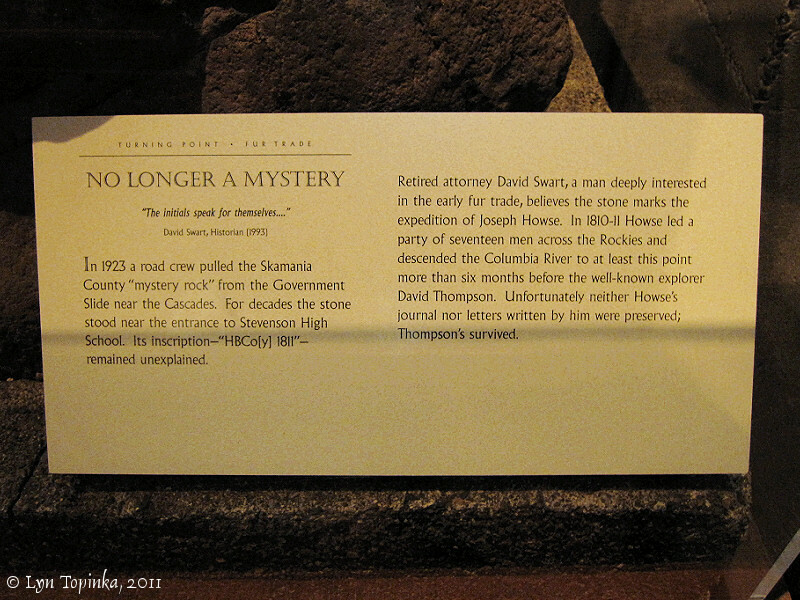 Source: Information sign, Columbia Gorge Interpretive Center, visited 2011. 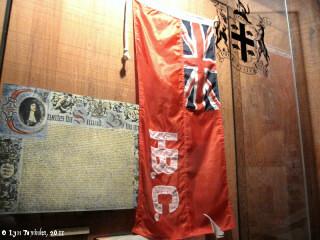 Click image to enlarge Exhibit, Hudson's Bay Company's (HBC) "Mystery Rock". Rock is behind glass showcase. Columbia Gorge Interpretive Center, Stevenson, Washington. Image taken July 15, 2011. 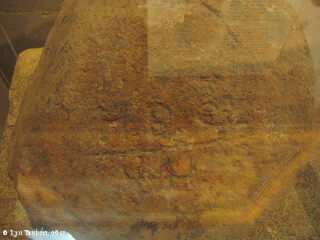 Click image to enlarge Exhibit, Enhanced image of "H B C 1811", Hudson's Bay Company's (HBC) "Mystery Rock". Rock is behind glass showcase. Columbia Gorge Interpretive Center, Stevenson, Washington. Image taken July 15, 2011. Click image to enlarge Map detail, 1841, Deer Island to Fort Vancouver, by Charles Wilkes, U.S. Exploring Expedition. Map shows location of the Hudson's Bay Company's Sauvie Island Dairy. Original Map courtesy NOAA Office of Coast Surveys, 2013. The location of the Vancouver Trout Hatchery and the Columbia Springs Environmental Education Center was once the location for the Hudson Bay Company sawmills. 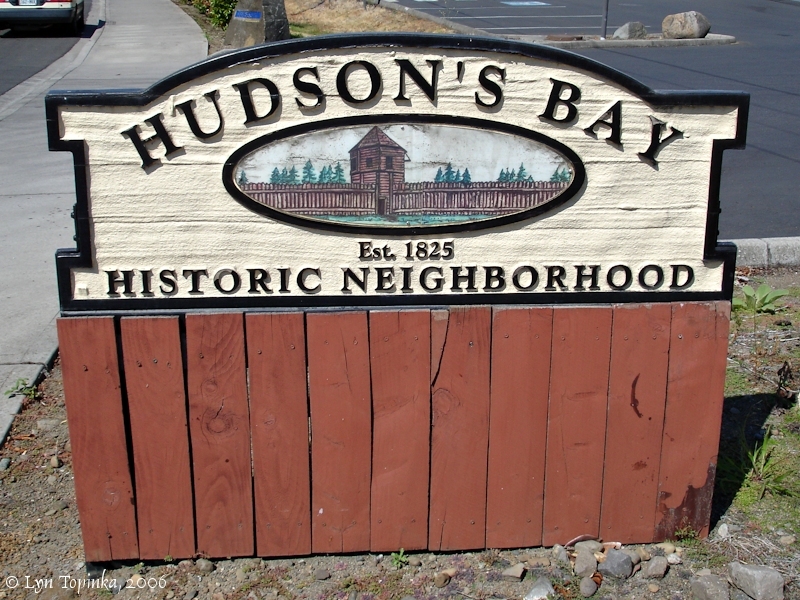 Click image to enlarge Hudson's Bay Company Sawmills sign, Vancouver, Washington. Image taken July 25, 2008.